If there was ever a topic on guns in our modern age that has been covered extensively, it is this one. A dead horse beaten beyond recognition, a broken record played ad nauseum, and still it persists! There is a reason for that. Despite the semi-auto’s supremacy, and the wheelgun’s purported obsolescence, the debate remains lively among gun owners. Below, this dauntless author will weigh in with his two cents, dispel myths and outdated dogma, and hopefully provide you, the reader, with a few considerations that you had not considered, whatever your pistol-packing preference may be. Before I graciously reveal the final, ultimate, binding, One-True-Answer (right, more like my Stamp of Arrogance…) to this decades-old question of which handgun is the ideal, one must consider the context in which a handgun is to be used. For the purposes of this article, I will be comparing both based on the criteria of selection for self-defense. When one considers a pistol for defensive (or offensive) use, the characteristics that make a gun desirable on an individual user level mostly transcend questions of who the user is; police, military or armed citizen. Sure, for large scale military or agency adoption, factors like service life, cost, and reparability all carry significant influence for adoption, but these are of less concern to the lone citizen carrier. Other criteria, such as reliability, capacity, ergonomics and caliber are of prime importance no matter what you do for a living, even if you don’t get a choice in the matter of what pistol you’ll be toting. I will of course mention throughout any standout advantages or disadvantages inherent to either design, and talk about roles or situations in which they excel. This article is not a white-paper, and will not be an exhaustive, pedantic analysis of various makes and models. We can “what about” any two matchups until the sun goes out, and, while entertaining, such debates are beyond the scope or tone of this piece. What Makes a Good Defensive Handgun? That question is a series of articles by itself, but in the interest of brevity I’ll offer my opinion. For our purposes comparison is constrained to semi-automatic pistols and double-action revolvers. A good defensive handgun will foremost be reliable, possessed of inherent mechanical soundness and efficiency, whether clean or fouled, and moreover reliable in any climate conditions the user may find himself in, be they hot or cold, dry or wet, dusty or dirty. A good pistol will be chambered in an adequate cartridge to prove effective against an adversary, under most conditions. The cartridge should not be too puny or too massive, with one being ineffectual and the other being too costly in terms of easy, quick handling of the gun. The gun should be mechanically accurate enough to strike the vital targets of a human, consistently, at a range of no less than 25 yards. A more accurate gun is better, but not if that accuracy is purchased in exchange of mechanical reliability. The size of the pistol itself should not be so small as to make the drawing and firing of it an exercise in dexterity, and not so large as to prevent effective carry about the waist, whether concealed or not. If the gun is to be compact or smaller in size, it should retain all of the above characteristics, unless total concealment is of uttermost priority. I’ll be making point-by-point comparisons using the criteria discussed at length above. Keeping these criteria in mind, let’s get to the subject at hand. I’ll warn you now; there will be a few points I’ll make that you may think run contrary to conventional wisdom on the topic. Whether you believe me or not, you have my assurances that my experience with handguns is considerable, much of it in a full time professional setting, and the product of many years of my own training and practice as well as the teaching of a great many students, and observing their growth and evolution. My opinions reflect that body of experience. Bottom-line, most modern semi-autos and revolvers from quality manufacturers are both more than reliable enough for serious defensive use. Many dogged proponents of the six-gun will cite the semi-auto as being more likely to malfunction, or less reliable than a revolver, period. It is my opinion that, practically, this is not true, but a fair performance comparison, and further, one lab-tested for certainty, is difficult to come by, but all around the modern semi-auto is certainly more robust, or durable, than a comparable revolver. This is owing to the more vulnerable vital components on the revolver: a revolver inherently relies on the delicate arrangement of the cylinder, mounted on the crane, in relation to the breechface and barrel. The cylinder is rotated and aligned by the interplay of tiny mechanisms such as the hand, stop and main pin. Any severe impact can damage these components and change critical tolerances, as can fouling, causing either significant issues, like the shaving of bullets as they cross the gap from chamber to barrel, or malfunction resulting from loss of proper timing. The timing of a revolver, itself the sum of a properly fitted and maintained action, degrades steadily over time with use, and where an autoloader may need only a few new springs to return to service, a revolver will need at the minimum the attention of a reasonably skilled gunsmith, and perhaps new parts will need to be hand-fitted in the action. Not all brands are equal, in this department. The old trope that revolvers do not “jam” is utter bunk. Revolvers do malfunction; they just suffer different malfunctions typically than a semi-auto. The revolver has the clear advantage in malfunction reduction over a semi-auto only in the instance of a failure to fire (that is the “click” instead of a “bang”), whatever the cause. A revolver shooter needs only to pull the trigger again, supplying a fresh chamber and fresh cartridge to fire, whereas a semi-auto will require immediate action, usually the tap-rack solution, to recharge the chamber with a new cartridge. Beyond this, though, things go downhill for the revolver: Revolvers are much more likely to be “short-stroked”, the trigger not being pulled completely to the rear, by users when fired rapidly. A bullet that is pulled slightly forward from its crimp will stop a revolver cold, possibly freezing the action, until it is extracted. Any piece of debris or grit that works its way into the action of a revolver, whether in the trigger group or around the hand or cylinder stop, may bind the action totally, necessitating disassembly for correction. A malfunction of this magnitude is comparatively rare on the semi-auto in my experience. For a semi-auto, inferior ammunition or magazines is the leading culprit in causing malfunctions, inducing failures to feed or extract, and will typically plague the gun until removed and replaced. In a revolver, assuming the cartridge will fit the chamber correctly and is not dangerously overcharged, it will only cause trouble by failing to fire as mentioned earlier. The short version is that when semi-autos malfunction, their typical malfunction is far, far less likely to be a showstopper than a malfunction occurring in a revolver. Anything besides a classic failure to fire, a “dud,” will often mean the revolver is out of commission. That is a major issue in a fight. As far as maintenance, or lack thereof, is concerned, the semi-auto requires more frequent preventative care than a revolver, specifically lubrication. The revolver is more forgiving of utter neglect, such as being kept in the sock drawer since time began, and then being called on to function. If one were more concerned with endurance, meaning a rigorous firing schedule, the semi-auto wins handily. A revolver, run hard and fast, will start to falter before the average semi-auto. A revolver does have a major edge over the semi-auto in this category when considering a subcompact or pocket gun: a snubbie revolver, whatever its chambering, will not suffer from a shooter-induced limp-wrist malfunction. There are few tiny semi-auto pistols that are standouts for all-conditions reliability. The winner in this category, if one desires a hard-running, rugged, and dependable pistol is the semi-auto. For self-defense against humans, both semi-auto and wheelgun have perfectly adequate offerings. Any of our mainstay choices are fine: 9mm Para., .38 Special, .357 Magnum, .40 S&W, 10mm Auto, and .45 ACP will more than suffice. Today we are seeing more than few revolvers from major manufacturers like Ruger and Smith & Wesson gain mainstream acceptance chambered for traditionally semi-auto cartridges like the 9mm Para. and 10mm Auto. If one is concerned with defense against large, dangerous animals, the revolver will have an advantage here owing to a greater variety of large magnum cartridges. .41 Magnum, .44 Magnum, .45 Colt, .454 Casull are all widely available in revolvers that can closely approximate a service revolver in size and weight, suitable for hunting or as dangerous animal defense pieces. Large, powerful cartridges like the .44 Magnum and .50 AE can be had in an autoloader, but are without exception massive, heavy affairs, and not known for reliability whichever platform they are found in. In this situation, the revolver is the once and future king of handguns. For capacity, the semi-auto is the undisputed champ, with the average 9mm or .40 semi-auto having 2 or 3 times the capacity of any comparable .38 or .357 revolver. Any service revolver with a capacity greater than 6 will have a correspondingly large and wide cylinder, which while no issue when carrying openly, can make the gun less concealable. Reloads too are far more easily accomplished under any condition with the semi-automatic pistol, and the methodology is the same whatever technique is employed: magazine out, magazine in, close slide if necessary. The revolver is much slower, and requires different techniques and equipment depending on the reload. It may necessitate a speed loader to fully reload an empty gun, where a reload with retention will require the use of a loading strip or loose cartridges. Both methods will require the gun to be opened and empties manually ejected. This greater complexity mandates training and practice of additional techniques to reach full proficiency with the wheelgun. This is fine bravado, and, yes, those 6 rounds may surely be enough, but I do not want less life-saving resources when my life is on the line. A gun is no good when it is empty, and a long, clumsy reload to get it back in gear is inferior to a quick, easy reload. I myself would not feel unconfident or unarmed with a six or seven shot gun, revolver or not. I’d wish I had an 18 shot semi-auto instead, but I’d feel well-armed if the gun was quality. However, the trend toward creation of higher and higher capacity firearms across all categories is a clue about the necessity of onboard ammunition, and any assertion to the contrary is romanticism or hogwash. Six may be fine, but 16 is always better. The winner here is again the semi-auto. Looking at fullsize or compact guns, the overall footprint of a given revolver or semi-auto is close enough to not worry about. Either will feature large grips that afford good purchase on the gun and will be close enough in size to carry well, either openly on the belt or concealed. A revolver’s shape, owing to the cylinder, will make it, usually, less comfortable to carry inside-the-waistband than a flat, smooth semi-auto. As the gun shrinks, though, things get more complicated. A subcompact semi-auto will have a form factor far more suited to deep concealment than a revolver of like size. Taking into account again the greater capacity of a compact semi-auto, you are getting much more gun in the same space with a semi-auto. Compare a Glock 26 or Smith & Wesson M&P9c to a Colt Cobra or S&W Mod. 42 or 642. You’ll see what I mean, and having 11 or 13 rounds instead of 5 or 6 in the same size envelope, in an easier to shoot pistol is a no-brainer. For fullsize guns, it is a tie. For compact and smaller guns, the semi-auto wins this category. This category is a little more nuanced than the others. All things being equal, a revolver will be more mechanically accurate than a semi-auto because a revolver has a fixed barrel. Yes, I know some semi-autos have fixed barrels. Yes, I know quality of the barrel and ammo makes a difference, I’m speaking in generalities, here. The stumbling block for the shooter to realize that accuracy is that of the trigger. Simply, the long, often heavy, repeated double-action pull of the revolver is much harder to shoot well than most varieties of semi-auto and slower for most to gain proficiency with. Sure, cocking the hammer allows a terrifically light and crisp pull, but thumb-cocking is not a valid technique to negotiate a defensive encounter, at least one where you are firing rapidly in a reactive mode. But nonetheless, if time is spent in mastering the revolver’s trigger it can shoot very well. The average stock semi-auto service pistol, save a few stand-out designs or one that has been upgraded, is not known for hair splitting accuracy. Part of that deficiency is mechanical, and the other part is the shooter; there are few who can claim to wring out the accuracy any given gun is capable of, and fewer still that can exceed their gun’s accuracy. Nearly any of them are accurate enough for defensive work. This is a tie, but the semi-auto has an edge for being easier to shoot well all around. A bone I have to pick with most revolvers are their less than ideal sights. Many revolvers, especially the subcompact snubbies, feature very rudimentary sights, often times a machined, coarse front blade and a primitive trough cut into the topstrap of the frame for a rear notch. If the rear is not that arrangement it will be the common click-adjustable leaf configuration that is very fragile. A few revolvers can accept a greater variety of durable, modern sight configurations, but not many. Semi-autos of almost every stripe benefit from a plethora of brands, styles and variations of sighting systems. This is an issue not just for shooting performance and shooter preference; the ability to zero the sights to the chosen load is important. One might make the argument that the typical ranges a revolver will be employed at will render zeroing irrelevant. This is demonstrably wrong, and does not get a pass from me; for revolvers with machined sights, short of changing loads, shaving the front sight down to raise POI, or tweaking the barrel to adjust windage, you have no way to zero the gun. Another shortcoming is the complete lack of rails on revolvers for the mounting of weapon-mounted lights. Off the top of my head, I can think of two that feature rails on the barrel shrouds: the S&W TRR8, and Chiappa’s Rhino series fullsize guns. Yes, I do assert that one should be competent with a handheld light in conjunction with a handgun, but WMLs offer great advantages in efficiency, and to be unable to take advantage of that will cost some points. Both semi-autos and revolvers are capable of accepting a variety of laser sights if desired. The modern semi-auto is clearly the winner, once again. The revolver has long been championed as an easier-to-learn gun, and I generally agree: there is little simpler than pressing one lever to swing the entire cylinder out of the gun, taking it out of battery, and then inspecting all the chambers simply and quickly to verify their status. To load, insert cartridges and close cylinder till it clicks. Done. You can teach that to someone in minutes. For a semi-auto, while still very simple, the order of operations is crucial for safety and certainty, and additional levers and controls may intimidate the new user. My opinion is it is only the matter of another half hour or so of training to ensure confidence with the semi, but the fact remains the revolver has an undeniably simpler manual of arms for loading and unloading. The tradeoff for that simplicity has been alluded to above: the revolver is much harder to shoot well. I see this as something of a Faustian bargain for new shooters. You can have a super-simple unloading and loading procedure that is slow and cumbersome for a low-capacity gun that is hard to shoot well. Or, you can have a quick, simple loading and unloading procedure in a high-capacity, easy to shoot gun that is slightly more complicated to use. That’s the way I see it. One scenario where the revolver is standout excellent is in the hands of a shooter with weak or injured hands or arms. Charging the slide on an auto is not always easy, and even when using good technique may prove very difficult or impossible for one with such compromised use of their hands. Here, the revolver shines: if a shooter has the strength to grip the gun and press the trigger, the revolver will run, and is completely immune to limp-wrist malfunctions. Guns, obviously, can hurt you. They can hurt you in more ways than one, and I don’t mean your pocketbook (ha! ): aside from the muzzle being the most obvious danger point on both, semi-autos and revolvers each have secondary danger points that can cause injury. For the revolver, the flash gap, that is the area between the front of the cylinder and barrel will project hot gasses and particulate out in a cone to either side with every shot. This spray can cause burning or cutting injuries, and is a significant risk on large-caliber and subcompact revolvers in particular. For semi-autos the ejection port whenever the slide is closing and top of the backstrap where it ends under the slide when the gun is cycling can both cause cutting or pinching injuries. Neither type of pistol is particularly deficient here. Nearly any person can learn to use one or the other well with minimal instruction, but the revolver’s is simpler, no question. 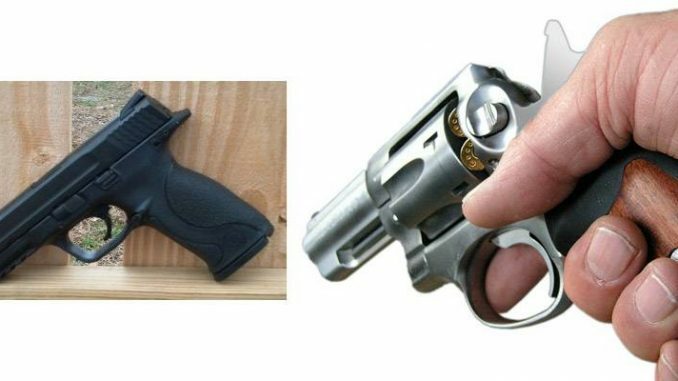 In a close-in, hands on fight, a revolver is less likely to malfunction if employed for a contact shot, as it has no slide to be pushed out of battery, and will only fail to function if something or someone physically impinges on the hammer or cylinder. Similarly, a compact revolver, especially a hammerless one, can be fired when inside a pocket and be expected to be ready to fire again when withdrawn. Few semi-autos will cycle successfully when the slide is snarled so by cloth or other material. This is a fringe benefit, but valid when discussing pocket carry, especially for folks in cold climates. The rise of the miniature red dot sight (MRDS) is the next major technological shift for defensive handguns. These sights, once acclimated to, offer the same benefits we enjoy as standard with red dots on rifles, namely increased speed and practical accuracy over iron sights. These sights will be seen with increasing frequency from here on out. Currently, they are seen predominately on semi-autos. Revolvers with frame-mounted top rail, or ability to accept a rail, can mount these sights, but that would be a less than ideal solution compared to the low-profile mounting seen on semi-autos. Time will tell if revolver manufacturers will move to make stock offerings direct-mount compatible. This author thinks the evidence is clear: the semi-auto is the current paradigm for a handgun. Most armed professionals and gun-carrying citizens choose the semi-auto pistol for serious social purposes. The combination of advantages that the semi-auto brings to the table is plainly superior for most circumstances. The revolver is typically relegated to a backup gun, often ankle- or pocket-carried, a far cry from its glory days when reliable, high capacity autoloaders were either rare or a novelty. And yet, the revolver persists. Is there anything inadequate about six or seven reliable, potent shots for defense? Is the revolver that hard to run well? Is it so fragile as to discount it from selection at all? I don’t think so. I do think that the semi-auto is the obvious choice for a defensive gun in nearly any situation, with the possible exception of a backup gun, and this author himself still prefers a J-frame or LCR for that role. The revolver may be obsolescent, but it is not obsolete: a reliable, powerful gun is always a reliable, powerful gun. If a revolver is all you have, or if your selection is limited to a cheap, poorly made semi-auto or a quality revolver, like a nice, used Smith & Wesson Model 10, I would take the wheelgun any day, and twice on Sundays. I would only encourage you to invest in the tool that will help you grow the most, the fastest, as a shooter. That gun is the semi-auto. What do you think? Am I absolutely right or dead wrong? Let us know what you think and prefer in the comments! Perhaps you should read about Delf A. ‘Jelly’ Bryce, Special Agent of the FBI, revolver shootist. If I wanted a “nightstand” gun, one which lived (secured) next to the bed or anyplace else for that matter, a revolver would be my choice. 5 years could go by and I would have no concerns that any spring “took a set”. As for reloads, your description on the process is spot on, except for one case. And that is a 45ACP revolver with full moon clips. These reload almost almost as easily as a magazine, and nearly as fast. Plus, if you reload, retrieving your brass is much more convenient. Springs don’t take a set. Cycling is what fatigues a spring. You can leave a quality semi auto magazine loaded for 20 years and it would function just fine. There have been 1911 magazines loaded since WW2 that were fired a few years ago and functioned fine. I’m a chemist, with metallurgy studies, in case you were wondering. You could leave a magazine loaded until the spring rusted out. My answer is several of each. My .38 snubby is a gun for a different purpose. It is relatively light, and it hides well. My .22 High Standard revolver fits a different bill, and for some people in my family, it is more accurate (fired single action) than my Ruger Mk2. I like the Glock 17 for some things, and I still have a soft spot for my compact .45, so I don’t want to choose. They all fit their own purpose for me rather well. If you are fighting Comanches, or are otherwise a spouse who refuses to learn anything about guns, then revolvers are things for you. Anyone with an IQ over 90 can master a semi-auto if they try. Obviously semi-autos provide many advantages. Revolvers are classic and fun to shoot. One round from any revolver will send most bad guys running, but I take a full size, high capacity semi-auto to the gun fight.